71 registered members (Alan_nc), 410 guests, and 274 spiders. I have been advised that the '73 850 Mk I gearbox Layshaft Bearing MAY be an issue and I have researched the possible failure and read all of the info out there on the subject, some written by you folks so without re-hashing the entire subject ad nauseum, is there a list-o-parts that will be needed to perform this repair/replacement...? 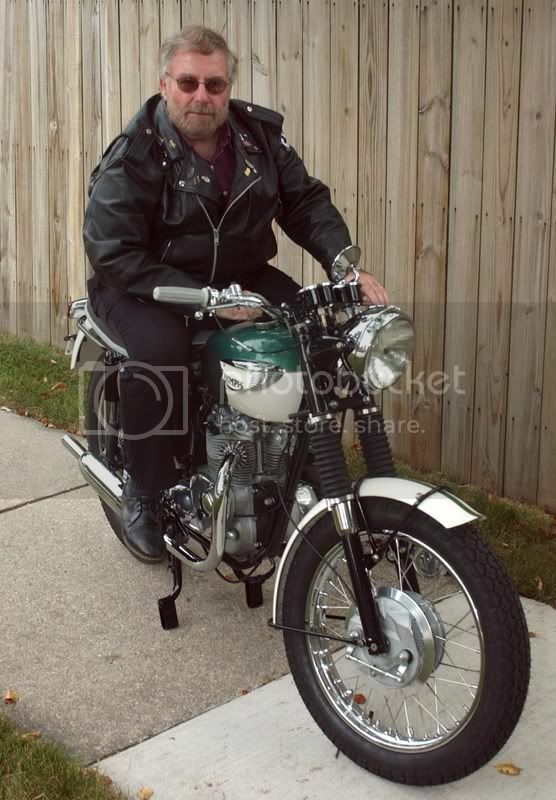 We (the owner of the Norton and I) have a well qualified Norton mech friend here and he will get the nod to assist in the work, I am not comfortable with doing the bearing replacement myself. We are also not comfortable with Not doing the repair. During this refurbish I would like to know also, while the gearbox is out for repair, I should be able to continue with assembly, engine install etc and install the gearbox into the cradle with no problem later...? Yes...? Thanks in advance for any assistance and advice here. If the box is out for refurbishment and there is a normal deep groove ball bearing in their stamped 6203 then you have 2 choices. 1. 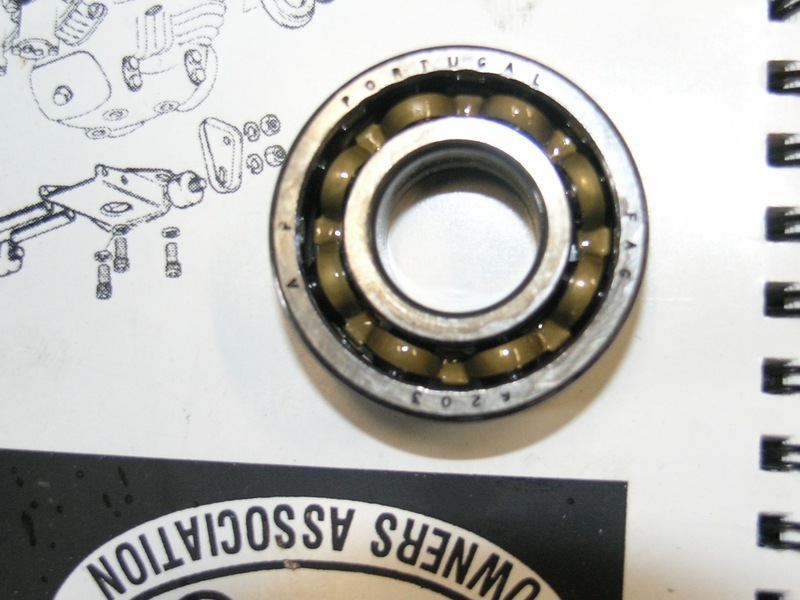 Replace the current ball bearing with a roller bearing NU203E, the E is a heavy duty version, as the layshaft now floats you may also need to shim the layshaft to control the endfloat so first does not start jumping out under load. 2. Alternatively change the current ball bearing for another ball bearing which has a higher quality cage made from a resin, Mick Hemmings developed this fix and as its still a ball bearing no shimming is required. FAG 6203 TB. The ball bearing in itself is not the problem but it is the steel cage that goes, then the balls drop to one side and start falling out and then get jammed between the gears locking the rear wheel. It can be done easily with gearbox in place. Parts needed are bearing and inner and outer gearbox gasket. Heating gearbox case with heat gun ,after disassemby, let's loose of bearing for removal. Freeze new bearing and heat case for installation. I have been going over the tech manuals and still not certain that I want to tackle the bearing replacement. Luckily we have Sherwood to handle the job. All set for the gaskets so I'll get the box over to him and pull it down and look for that offending bearing number. Last edited by L.A.B. ; 04/14/19 8:54 am. 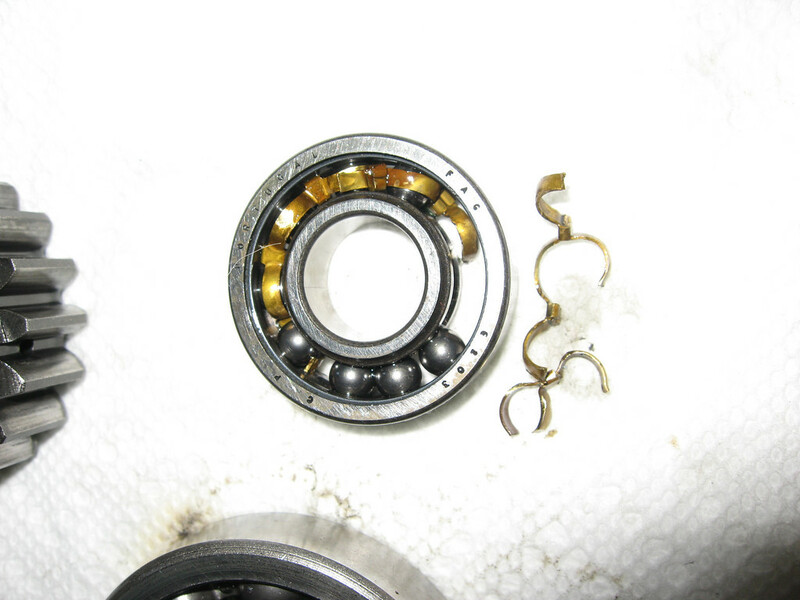 If I'm correct, the problem for late 74 and 75 is the 6203 is the BRASS cage on certain series bearings. The steel cage bearings would have not been the problem. If I am into a gearbox, I end up always replacing with the roller bearing version. However, I have always found that the need to add shims is mostly to accommodate using worn 1st gear dogs, since 1st gear is the only one without self holding reverse angle dogs. Added to that a worn 1st gear bush and mating layshaft aggravate the jumping out of gear problem. Personally I have never experienced this problem since I keep a fresh bush and inspect for a worn out cog holes and the mating dogs on the meshing gear. Not sure if this cage is steel or brass as it looks like a coating has been applied or it has discoloured over the years, the bits of cage and 1/2 balls I fished out from the bottom of my gearbox could have been cheese for all the good they were doing. This is supposed to be a '73 model but any 6203 ball bearing can fail regardless whether it has a brass or steel cage, just that the brass cage bearing is more prone to failure. That's the brass cage bearing. That could be discoloured brass or it could be tempered cold rolled steel. Destroyed the fag bearing cage, nonmagnetic and obviously is brass and not anodized steel." I have whole box 6203's in my hand . The FAG portugal brass one as in your pix has the folded over tabs for the cage. This is the one I took apart, in the last 6203 discussion last year? The SKF steel ones I have are peened little steel pins to hold the cage halfs together. The NTN cage halfs are steel spot welded together. THe FAG korea are steel cage halfs are peened with steel.pins. Yes, the Portuguese FAG 6203 was the 'brass' cage layshaft bearing fitted by the factory as far as I'm aware, others were steel cage (if that's the point you're making?). I know there are brass caged 6203's, just not convinced all Portuguese were brass, it's not a part of the ISO standard so they were free to use brass or steel. Mick Hemmings refers to steel cage when helping a magazine do a AMC rebuild. If you find a 6203 change it. Well, they all seem to be brass as I don't think we have seen evidence of an original Portuguese 6203 that did not have a brass cage but I'm happy to be proved wrong, not that it matters, because, as you say, standard 6203 layshaft bearings still in use should be replaced. These should go in the trash as they are not up to the service needed. Spot welded or peened pins are much stronger attachment on a much stronger steel cage. I have no problem reusing a good used riveted steel cage bearing. I did cruise the referenced classic mechanics article, however I again differ with MH on a few points. Our Norton gearbox guy Sherwood has the box to investigate and repair, I will advise regarding the brass cage and other cages that incorporate the folded vs the spot welded or peened cages. For the cost of the upgraded bearing, I seriously suggest you instruct him to replace any metal cage layshaft 6203 ball bearing (regardless of folds, spot welds etc.) with the upgraded bearing as it's not worth the risk. At best, it wrecks the gearbox but could cause a serious accident as the bearing has been known to fail with little or no warning, normally locking the rear wheel at whatever speed it fails and pulling the clutch lever won't free off the wheel. Here's just some of the examples we've heard about on Access Norton. These are the lucky ones, the unlucky ones we probably don't get to hear about. The layshaft bearing Andover Norton supplies for all Commandos is the 06.7710 roller. Yes the Norton wrench is certainly learned in the correct bearing to use however, just to be a pest, I have made a pest of myself in reiterating a couple of times that the replacement Must be of good quality cage construction/configuration. I have read several of the incidents and the words that caught my attention immediately were Catastrophic Failure and "It can Kill you"... If that does not get ones attention then I do know what would.